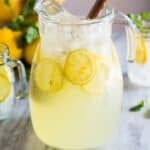 Easy Homemade Lemonade is a fresh squeezed lemonade recipe made with just 3 ingredients. It's the perfect refreshing summer drink. Combine sugar and 2 cups water in a saucepan over medium heat. Bring to a boil and stir until sugar has dissolved. Remove from heat and cool to room temperature. Strain the lemon juice through a fine-mesh sieve into a 2-quart pitcher. Add simple syrup and stir to combine. Refrigerate until cold. When ready to serve, add 2 1/2 cups of cold water and stir. Taste, and add more water if it's too sweet. Serve with ice, thinly sliced lemons and fresh mint, if desired. Makes about 7 cups of lemonade.